It is a massive security breach that New Jersey's two senators are calling a "major negligence" and a "management failure." It all started with a stranger who entered Newark International Airport's terminal C through a passageway meant for arriving passengers only. He then walked past a podium where a TSA worker was supposed to be stationed…but it now appears he was AWOL. After, this massive breach of security, the man, who remains unidentified, simply walked out of the terminal. The breach itself took one minute. But it took two hours before the TSA confirmed it had happened. Upon learning of the breach, TSA officials went back to their security cameras, only to discover that the one in place to record that area wasn't working. Luckily, Continental Airlines' cameras were working and now we have some clues as to what happened. At 5:20 p.m. Sunday evening surveillance images show the TSA officer responsible for preventing entry to the secure area walking away from his post. At 5:21 p.m. A man who was seen loitering near the area earlier walked through the passageway and into the supposedly "sterile" area. By 5:22 p.m. Just one minute later, the TSA officer was back at his podium but the breach had been made. At 5:23 p.m. A bystander can be seen telling the TSA officer that a stranger, with no one stopping him, had passed through. Still, according to the New York/New Jersey Port Authority, it wasn't until 6:40 p.m., over an hour after the original breach, that TSA officials alerted authorities that the cameras weren't working and that they'd have to borrow images from Continental's cameras. From there, it was another hour later, 7:45 p.m., when the TSA finally emptied the concourse to do a full security sweep that lasted four hours and shut the terminal down for a total of six hours. Today, appalled passengers and New Jersey politicians are outraged. "This is a disaster in the making," said Senator Frank Lautenberg, D-N.J., "To permit that camera to be down and discovered in the moment of crisis is an outrage." A security expert we talked to was equally shocked. "If that wasn't working, you've got to ask yourself, what else isn't working?" said Charles Slepian of the Foreseable Risk Analysis Center. 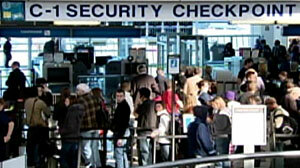 Lautenberg is calling on the TSA tonight to release the suspect's image to the public so the person can be questioned. Three days later, he has still not been found. Meanwhile, the TSA officer who walked away from his post has been put on administrative leave and the TSA today said it "regrets the inconvenience caused on Sunday…the circumstances are under review." +Could Technology Have Stopped Christmas Attack?